As an airplane prepares to park after landing successfully on the runway at Changi Airport Terminal 2, things go wrong. The pilot does not follow the air traffic controller's instructions, and the plane collides into a parked aircraft and both burst into flames. This was a scene simulated at Republic Polytechnic yesterday as students took on the roles of air traffic controllers, ground controllers and pilots in a new facility that simulates the day-to-day operations of an air traffic control tower. 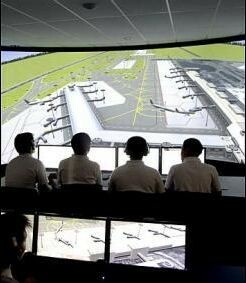 The Virtual Aerodrome Laboratory is fitted with a screen with a 120-degree field of vision - a third of the range of a screen at an actual control tower - showing the view from the tower at Changi Airport. Developed by home-grown firm ST Electronics, the lab is the first such facility in a tertiary institution here. It caters mainly to the 360 students taking the civil aviation diploma course. The lab, which has been in use since October, provides a realistic environment for them to learn about different aspects of aviation management. This can range from giving voice commands for aircraft taking off and landing, to reacting to crises such as plane crashes, and even unloading baggage. Course instructors can design exercises where things go wrong, so that students learn how to handle emergencies. Different weather conditions such as heavy rain and fog can also be simulated. "Here, students can experience something that is forbidden in real life," said Dr Wang Jianguo, director of the polytechnic's school of engineering. "You can't walk into an airport control tower and try anything. Here they can make mistakes and learn from them." Second-year student Kane Chua, 22, said the new lab helps him to better understand concepts he learns in class. "Previously we just watched videos and listened to voice clips to hear how pilots communicate with air traffic controllers," he said. It is estimated that the aviation industry will create 6,300 jobs from now until 2015, said the school's principal Yeo Li Pheow in a speech yesterday. Its aerospace diploma courses provide more than 300 graduates each year to meet the industry's growing manpower demands, he said. Under an agreement signed with ST Electronics yesterday, internship and industry project opportunities will be available to students. The company will sponsor a scholarship of $2,500 to the top second-year civil aviation student next year. Republic Polytechnic also has a 1,500 sq m aircraft hangar that allows students to study aircraft structures, systems and engines. It was opened in October last year and houses a business jet, a light aircraft and a microlight aircraft.